If you haven’t upgrade to 9.x yet, be sure to check out what’s new in Studiometry 9.x. Upgrades from 8.x are $59.95 USD per license and include free updates until Studiometry 10.0 is released in late 2012. 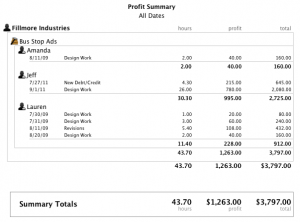 Studiometry 9 gives you many new tools to help better analyze your business’s income and profit. In previous versions of Studiometry you were able to create items with “markup”, allowing you to enter your cost for the item as well as what you charge your clients. This is a great solution for “goods”, but for “services” there wasn’t a solution in place to track cost for hourly work items. Many Studiometry users have employees or contractors that they pay a specific amount per hour for their work, and in Studiometry 9 this can now be tracked using Cost-Rates. Cost-rates are, in a nutshell, how much you pay per hour for a specific work item. If you subtract this from the billed rate, you’ll end up with your profit. Studiometry 9 gives you many flexible ways of tracking the cost-rates for your work items. It’s really a great system because you can set up Studiometry to automatically populate cost-rates based on your exact needs. Cost-rates can be set individually for Employees or Contractors, set by default for an entire Debt/Credit type, or set manually for each item. You can even choose to have certain Employee’s or Contractor’s cost-rate override the Debt/Credit type’s default cost rate. Because of the new ability to track how much money you actually make for your work, Studiometry can now easily calculate and track profit for entire projects and clients. This adds a completely new metric for measuring the value of projects and employees, which could be used to help focus your business on more profitable projects and make more money. 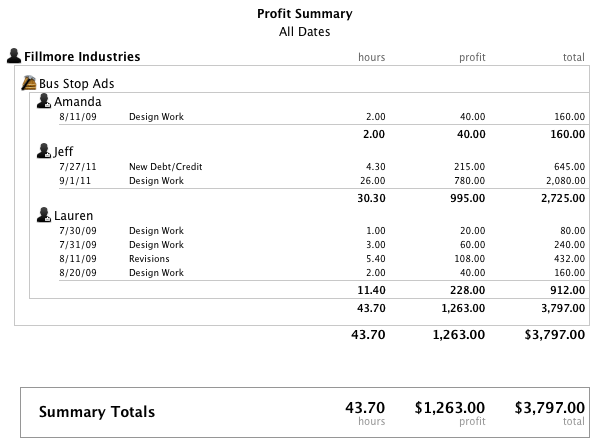 The powerful Custom Summaries features get even better with profit integration in Studiometry 9. You can now calculate and display Profit based on client, project, employee, type, or specific date ranges within your summaries. The ability to, for example, see how much a specific employee actually made for your company in a certain time period can be a very useful analytical tool. Tons of new invoice template features have been added for Studiometry 9, giving you much more control over how Studiometry produces and delivers invoices. The big new feature is the ability to send invoices as PDFs. All emailing and exporting of invoices will now automatically be done as a standard PDF file, created using your customized templates. This gives many benefits over the previous PNG exporting, including much better native text display, zooming capabilities, and the ability to copy text from the delivered invoice. It’s a much more flexible and standardized delivery method that will make reading invoices easier for your clients. Previous versions of Studiometry only had one option in terms of pages for invoice templates: the first page would be shown once, and the second page would repeat until all items have been displayed. This works “good enough”, but many users wanted to be able to customize this behavior. 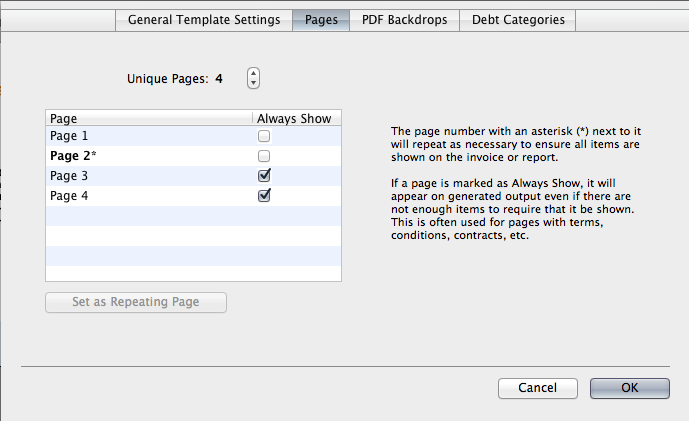 In Studiometry 9, you have complete control over the number and type of pages in an invoice template. You can create any number of unique pages, and then select whichever page you’d like to be the “repeating” page. This means you could, for example, have a cover page, several pages of items, and then a final “totals” page at the end. This was not possible in previous versions of Studiometry, but now it, and many other configurations are possible in Studiometry 9. Thanks to the introduction of PDF exporting, we now have the ability to add clickable links to invoice output. This means that you can easily add a “pay now” link to your invoice that your client can click. Links can even contain dynamic variables, meaning you could include a price or email within the link to create a Paypal payment link, for example. 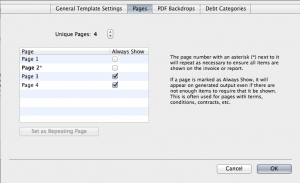 A great new addition to Studiometry 9 is the ability to use a PDF as a backdrop for your invoice templates. This means you can design the background of your template in whatever program you’d like, and then drop the PDF into the background of your invoice template pages. Studiometry will simply draw the information and prices for the items on top of the existing PDF. It’s a great, quick way to easily make customized invoice templates. Studiometry already has some great features available if you like to summarize items on your invoice by category. The only problem is that many people were saying “I don’t want a specific category appearing in the category summaries”. In Studiometry 9, you can specify on a per-template basis which categories will appear in lists, giving you the power to create more customizable summaries. Templates in Studiometry 9 now give you the ability to show or hide items based on the status of the template. You can have a “paid” watermark that will automatically appear when generating the invoice only if the invoice is actually paid. You can also add overdue notices, retainer statuses, and more based on the new “Show” setting for template items. It’s finally here! This is a huge update for us that’s been many months in the making. We’re very pleased with the amount of quality features we’ve added to our flagship product with this release. We’d like to say thank you to all of the great beta testers that helped find and report many issues as well as refine this release into a great product!